I Tried Picking Up Strangers With Tater Tots. Here's What Happened. Let me preface this by saying I think buying a stranger a drink in the name of breaking the ice is both antiquated and cheesy as hell. That's why I meet all my sexual partners the old-fashioned way: hanging out at the public library hoping someone will ask me to a Sadie Hawkins dance, or hitting people I have a crush on with my car -- giving them amnesia -- then convincing them we have been married for 10 years and asking my friends/fam to roll with it. At any rate, most guys (and some girls) do the awkward-drink-buying-pickup-tango at some point in their sexually frustrated lives. But in my mind there has to be a better way. Firstly, the buying of drinks only proliferates binge-drinking culture… which is apparently bad. Secondly -- as I've stated before, it's lame and cliche and you don't want to be either. Thirdly, in a bar, the person you are trying to talk to likely already has a drink. Don't buy people something they probably don't need, buy them something they almost definitely want. 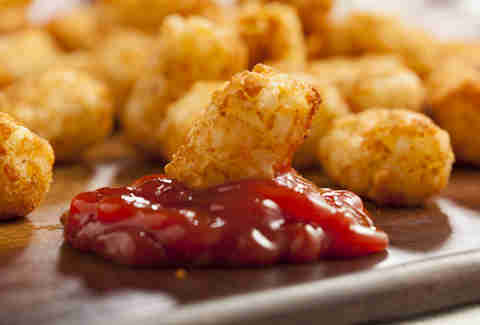 And everyone desires tater tots. They defy any common barriers of gender, relationship status, and even physical attraction. So I went out with my slimiest, bro-iest friends to the worst Manhattan bar I could think of (that sells tater tots -- which most do) and I tried out my new romantic strategy firsthand, hopefully to prove it's validity. And the results were as spectacular as a random tater tot thrown in your order of regular fries. Which is to say, extremely spectacular. While my friends prowled the floor of the bar like sharks circling wounded seals (if seals could handily reject the advances of hungry sharks with aggressive eye-rolls, that is), going unsuccessfully from girl squad to girl squad under the lights of 1,000 LCD screens, I stayed back and tried to find my first test subjects. I found a group of three women, sitting at the opposite corner of the bar. Since this is definitely not something I usually do, I summoned my inner douchebag by pretending to be Vince Vaughn from Swingers... or actually Vince Vaughn from any movie, and told the bartender I'd like to order some tots for the ladies at the far corner of the pickleback-soaked bar counter. After an excruciating 10-minute wait -- the taters were delivered to the women at the corner of the bar. The runner just dropped them off and skated away, leaving them befuddled. They grabbed our bartender, Julio, and told him there was some kind of mistake. Julio told them there were no mistakes in his bar, dammit, and that the steaming hot tots (side of ranch and everything!) were coming at them directly from the gentleman at the corner of the bar. Me. When they looked over, I didn't know what to do -- so I just waved. One of the women -- who I can assume was the leader of the crew, because of her aggressively tweezed eyebrows -- approached me with a tater tot in palm and asked me, matter of factly: "What the hell is this all about?" I told her I was just trying to say hello, and instead of offering to buy drinks, I thought they would appreciate tater tots more. Mainly, because they are delicious. "Oh," she said, the right angles of her brows softening into semi-appreciative semi-circles. She motioned for her friends to come over, tots in hand, and we talked for a few minutes about how inventive and fun my idea was. They loved it. They genuinely loved it, calling it -- and I quote -- "surprising," "inventive," and "the first new thing they've seen in a long time," whatever that meant. Most importantly, it gave me a chance to talk to them, which was the entire point of the operation. My friends, who were growing restless prowling the floor, took note. Once our test of the test was completed and successful, my friends wanted in. I let them choose a group of girls (or guys!) they wanted to meet, and they decided to settle on a group of seven people, five girls with two guys, to try our second round of tot-seduction on. They were at their own table, and deep in the thickets of their own conversation. It would be practically impossible to invade their circle any other way. We decided to gift them the greatest gift of all (aside from love): TWO plates of piping-hot tater tots, and asked Julio to tell the runner to tell the table they were directly from the group of gawking dudes at the bar, as my friends prepared to swoop in and start a'mingling. When the plates arrived, the formerly boisterous conversation at the table hit a full stop. We saw the runner motioning to us. The table exploded in laughter. While the more self-conscious members of our group internally debated whether the gaggle of 20-somethings at the table were guffawing at us or with us, the more simple among us just gave vacant, hopeless smiles -- like a 10-year-old asking his parents for a guinea pig. Finally, two of the women at the table came over, congratulated us on "the best pickup attempt she's ever seen... if this even is a pickup attempt," and asked if we wanted some of the tots we brought into their lives. Some of my group swooped in and filled the empty spots in the populated booth like dental implants in a hillbilly's rotten mouth. The girls (and guys!) there all applauded the novel concept, and agreed that they wouldn't have been as into it if we ordered them shots or beers. Yep, that was kind of the point. So things went swimmingly in my first two attempts. Like, swimming-through-a-vat-of-ranch-dressing swimmingly. My friends branched off, and started trying it on their own (it was a big bar) -- and every reaction pretty much lined up with the two detailed above. Except one. One was bad. "Excuse me, did you just order us tater tots?" asked a woman in a red dress, swishing a neon-blue potion in a martini glass incredulously. I told her yes, and my friend added, "I hope you like them!" "Why did you assume we wanted tater tots? Do we seem like we need to eat something? Or are you saying we need to chill out on drinking for a little?" she said, her Windex-in-a-glass liquid spilling haphazardly on the floor in front of her (and a little on my shirt). I'm not even sure if an industrial-strength fire extinguisher could squelch these flames. But I tried. I told her we meant no harm. I said we were just trying to say hi. I also told her we were not trying to imply anything personal with the tots (I mean… c'mon) and that we were sorry if any inconvenience was caused. 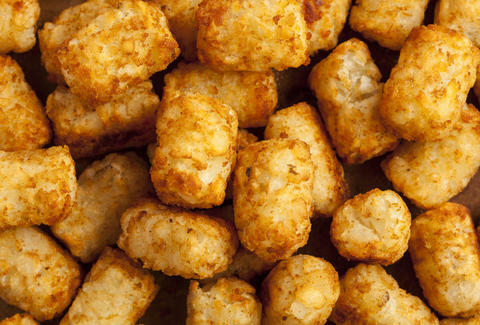 She gave us the tots back, which was fine, because everyone loves tots. Guys, if you are going to be weird and creepy enough to swoop in on strangers and buy them something at a bar in an attempt to spark a dialogue, buy them something unique. Tater tots, onion rings, curly fries… pretty much anything you can grab a handful of and dip into ranch dressing. Or just go on Tinder. It's probably easier -- and you definitely won't get neon martini swill on your shirt. I mean, at least not immediately.